I started, systematically, removing harsh chemicals from my home several years ago. One of my latest stops has been in the laundry room. I thought this step was going to be quite a bit more complicated than it ended up being. But by the time I arrived here, I had already stocked my home full of most of the essentials for cleaning naturally, which also help with laundry. Here are a few of my favorites so far, feel free to experiment a little and make some of these recipes your own. Most DIY laundry detergent recipes call for grating bar soap and adding borax. I haven't been too thrilled with this. I typically prefer using liquid detergents, but lately I have been using soap nuts. I know it sounds crazy, but they really do work. You can use them conventionally, just add a handful of the nuts, in a linen bag, to your laundry. Or you can grind them up and use the powder. I recommend spending a little extra and getting the higher quality nuts if you want to start using them. If you want to grind them, my favorite method is to use an old coffee grinder. Just don't overload it and grind to your heart's content. You can use just this powder as a really effective detergent. 2-3 teaspoons per load is sufficient. Or you can mix it with baking soda, Epsom salts, and/or essential oils to make an all-in-one detergent and fabric softener combination. Mix all ingredients and store in an air tight container. Use ¼ cup per load of laundry. However, if you prefer liquid detergents, here is one of my favorite recipes. You can pick up the washing soda at any grocery store, or you can make your own. Wellness Mama has a great tutorial here. Mix the first 3 ingredients together in a 1 gallon container. Add in the hot water to dissolve the other ingredients. Fill the container most of the way with water and add in your essential oils. Shake before using to help ensure that everything is mixed properly. It's that simple. Use ¼ cup per load. The most simple and easy fabric softener is baking soda. Simply add ¼ cup to your laundry while it's washing. Baking soda also doubles as a brightener, which is a plus. If you are using a liquid soap, add the baking soda in during the wash cycle. However, if you are using a powder, add it in during the rinse. Believe it or not, Epsom salts are another really easy way to soften your laundry. You can use them the same way you would use baking soda, or you could simply add them into your laundry detergent recipe. However, I prefer to combine these methods and add a little something special, essential oils. Adding essential oils help to make your laundry smell fresh, but essential oils don't stick around as long as the artificial scents you find with the chemical detergents and fabric softeners at the store. Some of my favorite blends for laundry include lavender, citrus, and juniper. My current favorite is 20 parts Lavender, 10 parts Pine, and 10 parts Grapefruit. Feel free to play around with your favorite essential oils, or make seasonal blends (peppermint is great for the holiday season). Mix all ingredients together and store in an air-tight container. Add ¼ cup to your laundry during the wash, or mix with your laundry detergent powder. Dryer balls are also a great help in the fight to soften your fabric. However, they are not my preferred method as the most natural, and best working, ones are wool, and at least one member of my family has a wool allergy. But if you don't have a wool allergy to worry about, I highly recommend them. They are easy to toss into your drying cycle, and if you want to boost the scent of your laundry, you can just add a few drops of essential oils to the balls before doing so. In general, to whiten and brighten, use lemon juice. 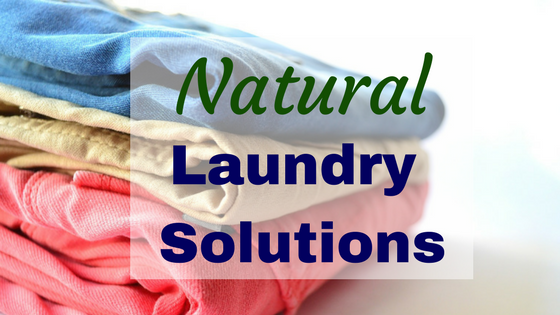 Simply soak the laundry you want to brighten in a solution of 1 cup of lemon juice to 1 gallon of water. Soak the laundry over night before washing. Ink and paint stains can be treated with rubbing alcohol. Simply soak the stain in rubbing alcohol for 20-30 minutes before washing. For tomato based stains, rub white vinegar into the stain and wash immediately. For grass and food stains, treat with a 5/50 mix of hydrogen peroxide and water before soaking. Wash immediately. Grease and oil stains can be a little more complicated. Start by sprinkling the stain with dry baking soda. This will absorb and remove excess oil. Brush this off and soak in undiluted white vinegar for 15 minutes. Rinse, then scrub with liquid dish soap before washing. For protein stains (vomit, blood, urine, poop, egg, etc), the first rule is to NEVER wash in WARM water. This will set in the smell. First you should soak the stain in cool water. Then, wash with ½ cup hydrogen peroxide and ½ cup baking soda in addition to your normal detergent, in the washing machine. When treating stains, always work from the back to avoid rubbing the stain in more. When you want to scent your laundry, the best time to do so is in the drying cycle. Just put a few drops of essential oils onto a cloth or dryer ball and throw it in with your laundry. I hope these solutions help you with your laundry endeavors. For more essential oil blend ideas, check out my previous entry, Herbal Home Fresheners for Spring. If you have any questions or comments, please leave them below!